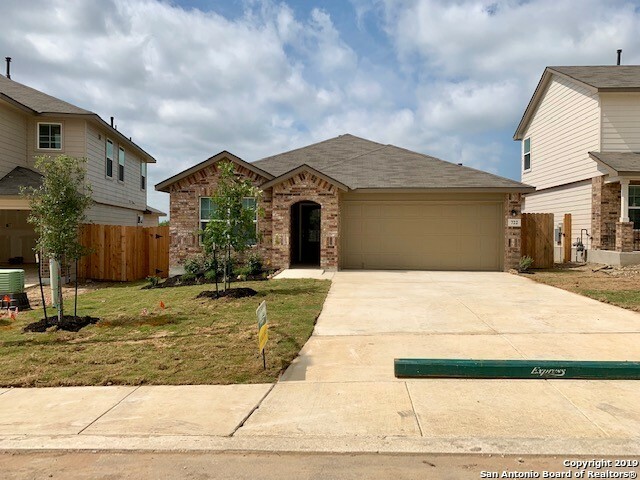 All MISSION DEL LAGO homes currently listed for sale in San Antonio as of 04/22/2019 are shown below. You can change the search criteria at any time by pressing the 'Change Search' button below. "This two-story, 5 bedroom, 3.5 bath home features 2678 square feet of living space. The first floor offers a separate dining area adjacent to a large open kitchen with eat-in breakfast bar. The kitchen area opens to a spacious living room that extends to a large covered patio, perfect for outdoor dining! Just off the living room is the master suite which features a separate tub and shower and large walk-in closet. 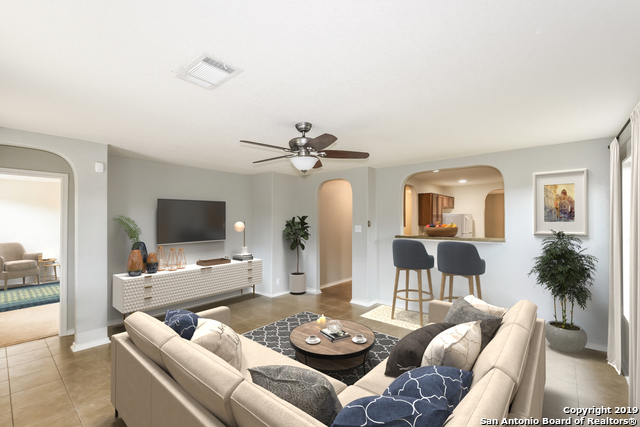 The second floor highlights a spacious game room, two full baths and four bedrooms"
"This beautiful one story home features an open floor plan with 3 bedrooms and 2 baths, and a study. The master bath features a spacious walk-in shower. A large covered patio located off the family room. Walk directly to play golf at the Mission Del Lago Golf Course." "This beautiful two story home features an open floor plan with 3 bedrooms, 2 baths and a powder bath downstairs. The large kitchen island overlooks the family room. In the master bath, upstairs you will delight in a luxury walk in shower. A gigantic game room for family entertainment is also upstairs. A large covered patio located off the family room for enjoying evenings and entertaining. Elementary school is located in this community. 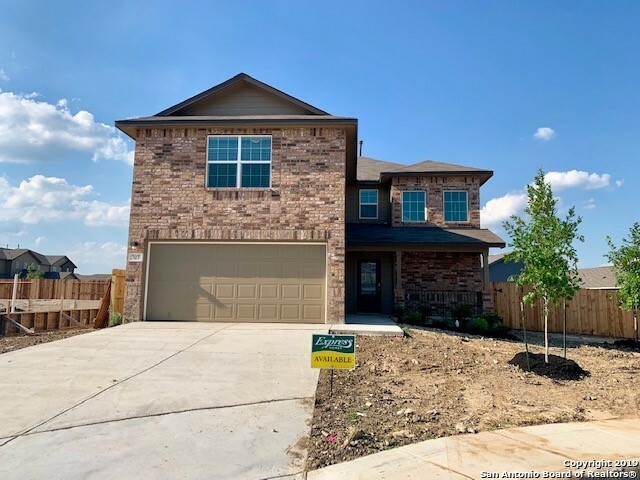 Walk directly to play golf at the Mission Del Lago Go"
"This two-story, 4 bedroom, 2.5 bath home features 2323 square feet of living space. The first floor offers a separate dining area adjacent to a large open kitchen. The kitchen opens to a spacious living room that extends to a large covered patio, perfect for outdoor dining! Just off of the living area is a powder room and master suite which features a large walk-in closet. The second floor highlights a spacious game room, a full bath and three addt'l large bedrooms." 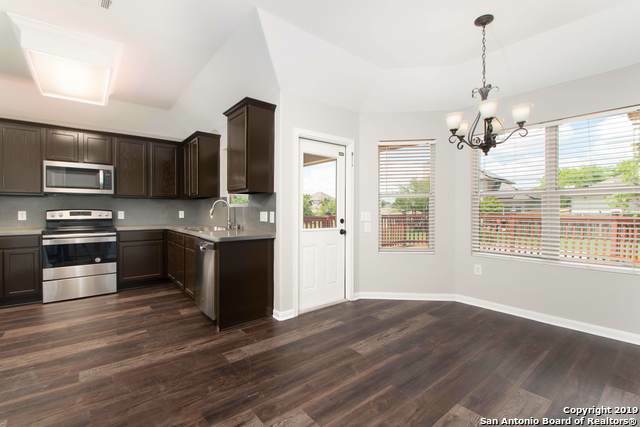 "This two-story, 3 bedroom, 2.5 bath home features 2241 square feet of living space. The first floor offers an inviting entry way with powder room that leads into the living area. The living area then opens up to the breakfast nook and open kitchen. The second floor highlights a large game room, perfect for entertaining! A private hallway leads you to the secluded master bedroom, bathroom and large walk-in closet. Also included is a covered patio and 2-car garage." "Single story, 4 bed, 2 bath home features 1901 sqft! This layout features an entry way that leads to a private hall connecting two secondary bedrooms and a full bath. The entry hall opens to a large family room that flows into a spacious eat-in kitchen and dining area. A short hallway off the living area leads to a utility room and secondary bedroom with walk-in closet. The large master suite is located off the kitchen area and offers a nice master bath and spacious walk-in closet." 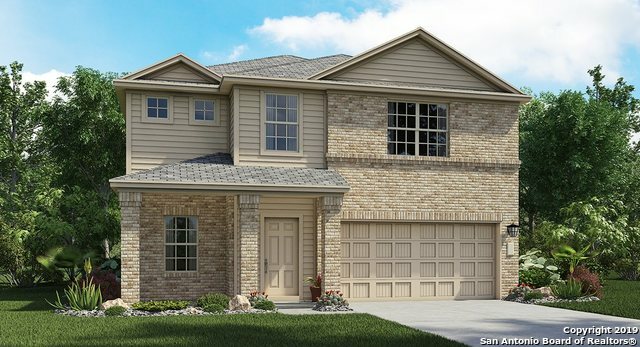 "This splendid one-story Barrington Collection home greets you with a long foyer when you enter the home. Two secondary bedrooms are to your left, sharing a secondary bath. Walking through the foyer, the home opens to a spacious kitchen that flows into the dining room and large family room. Relax in the evenings on the covered patio. The master bedroom features its own private bath with dual sinks, a large walk-in shower and a grand walk-in closet." "This single story, 4 bedroom, 2 bath home features 1703 square feet of living space. This open concept layout offers an eat-in kitchen with adjacent dining area. The spacious living area extends to a large covered patio, perfect for outdoor dining! The large master suite is located off the living room and has a spacious master bath and walk-in closet. Also included is an elongated foyer and 2-car garage"
"This single story, 3 bedroom, 2 bath home features 1651 square feet of living space. The layout features a separate dining area that leads to a nice open kitchen. The large master bedroom is just off of the family room and features a spacious walk in closet. 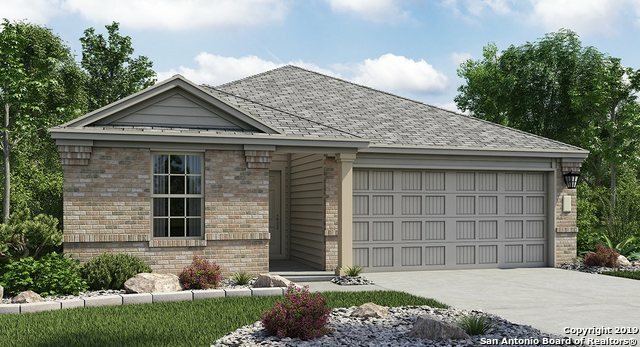 This floor plan also includes a 2-car garage and large covered patio." "This charming 1-story has it all! 2 of the 4 bedrooms are master bedrooms with their own bathrooms & then the home also offers 2 other secondary bedrooms that share their own bathroom. Beautiful flooring through out & no carpet! Enjoy the open concept through out the main areas with a nice open kitchen, living room & dining area that would be perfect for entertaining. Backyard offers covered patio & plenty of room to play. Located in a quiet neighborhood right next to golf course & close to"
"Move-in Ready! 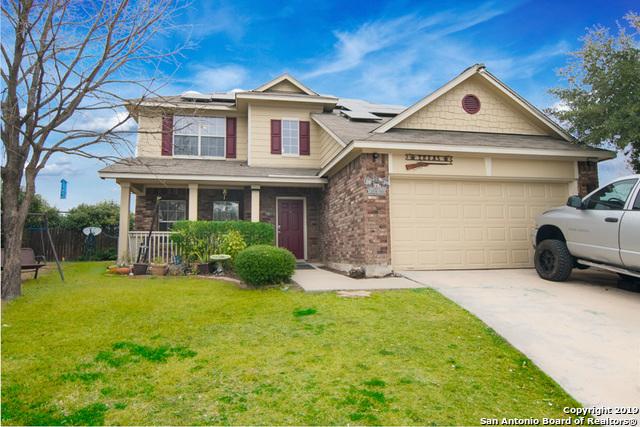 Beautiful 2-story, with master downstairs, barely lived in & exceptionally well maintained! Welcoming large front porch. Spacious dining room Or study/living in front. Big kitchen w granite counters, island overlooking lg family room w high ceilings. Gas cooking, fridge conveys! Oversized master suite, dual vanities, sep shower, garden tub. Upstairs lg game room, 3 additional bedrooms w walk-in closets! Seller extended concrete for covered patio in back. Walking distance to pool &"
"Welcome Home! This beautiful 5 bedroom 2 1/2 bath is ready for your family! Featuring 2 separate living areas, 2 oversized master bedrooms (1 upstairs, 1 downstairs), and SOLAR PANELS that are free and clear! You wont find a home this size, at this price with a NEW ROOF, Solar Panels and TWO master bedrooms anywhere! Within walking distance to the elementary school in a quiet cul-de-sac. This home also includes a video security system to ensure your home is safe at all times! 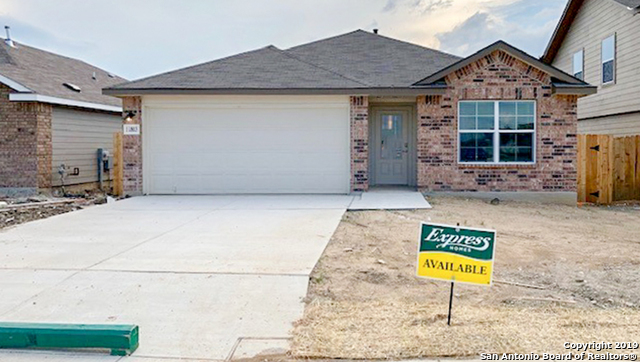 This home wont last"
"Built in 2011, this San Antonio two-story offers stainless steel appliances, master bathroom with walk-in shower, loft den, covered patio, and two-car garage. Upgraded features include fresh interior paint. Community pool, golf course, clubhouse, tennis courts, park, and trails are part of the HOA. This home has been virtually staged to illustrate its potential! Thanks for viewing!" "Buyers will appreciate this 4 bedroom home on a cul-de-sac built by Plantation Homes. With a formal office down & a loft up, there is room for all. Covered Patio & 30x15ft deck are ideal for entertaining, just down the street from the community lake. 15 SEER HVAC replaced in 10/18. Laundry up with modular manifold plumbing. New 2019 tile in upstairs bathrooms & fresh paint in other areas. By both Mitchell Lake & Cassin Lake. 6m to Brooks, 2m to 410/281, 3m to Stinson Park. 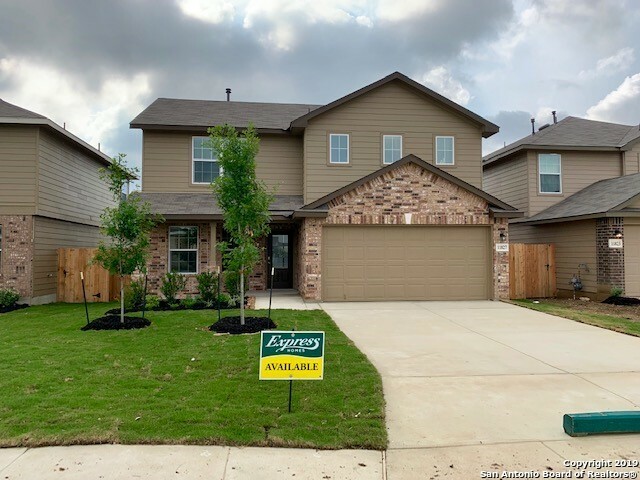 WELCOME HOME"
"Walk in to this lightly lived in & well maintained home that offers a spacious open floor plan, granite countertops, wood vinyl flooring and an abundance of natural light located in the growing community of Mission Del Lago. Enjoy your morning coffee or relax in the evenings on your patio composite deck. Located near the beautiful 18-hole Mission Del Lago Golf Course and Mitchell Lake Wildlife Refuge and Audubon Center. Close to downtown SA, Brook City Base and quick access to major highways." 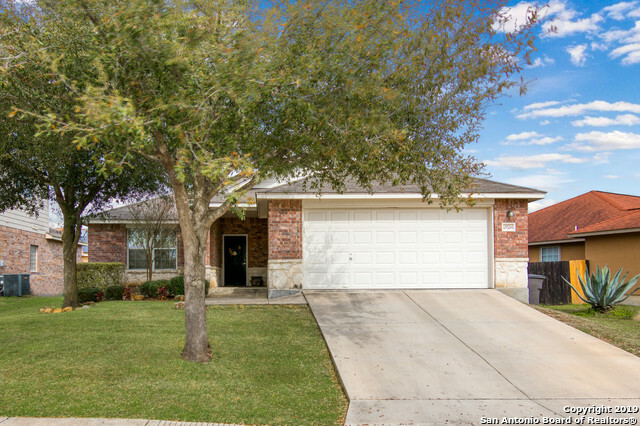 "Recently Updated Beautiful 3Bd 2Ba 2Car Single Story Home by Mission Del Lago Golf Course. Marble Tiles in living area, Vinyl wood plank & Engineered wood flooring in all other areas, no carpet. New SS appliances in kitchen. Covered patio & Extended deck provide a great space for your outdoor pleasure. FHA available after 05/20/19, Conventional & VA available now. Move in Ready. Come see your future home today before it's gone!" "Lovely, well maintained one owner home. Seller will consider paying some closing costs. This 4 Br 2.5 bath home has an open floor plan with the Master downstairs! NO house behind this one, only a neighbors huge back yard. This beauty has a large game/TV room with wood floors in the entire upstairs. Covered patio with a large back yard for family and entertaining. Solar Panels convey and really save on your utility bills. Neighborhood has a pool, playground, jogging trails, sport court and an e"